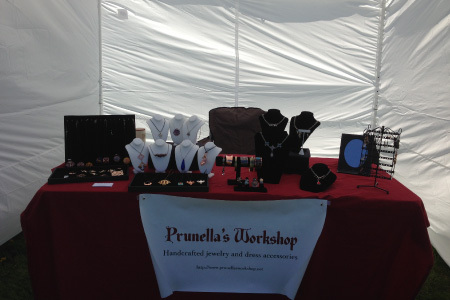 I have just begun to bring my wares to outdoor craft shows. 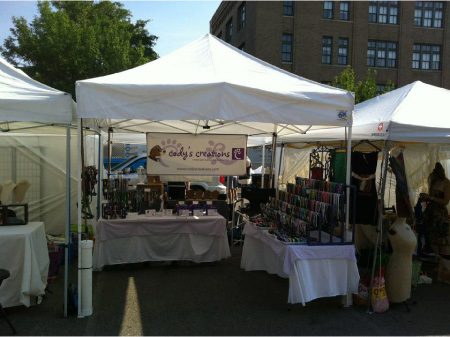 Imagine my dismay when I set up at the first show and I realized my set up looked, well, lame. It was a fairly windy site, though the weather was beautiful. I set up my white EZ-Up tent with three walls to block the wind (successfully) and my six-foot table. I had two four inch risers with neatly fitted black cloth coverings, a lovely red table cloth, and the Prunella’s Workshop banner across the front of the table. Customers were crouched down all day trying to see the jewelry I had spent so much time making. The white expanse of my walls swallowed up my table, causing it to get lost. This set up was rather plain with little to no personality or indication of what type of jewelry you would find. In short, there was nothing about my display that said my work was special or desirable. With two weeks until the next show, I determined it was time for a break from creating jewelry and I needed to get my brand working for me. When branding, we need to think about who we are and how we want our customers to feel about our products. We need to look professional and clean. These concepts sound like something big corporations worry about, not one sole proprietor; however, this is how they became the booming businesses they are today. Furthermore, professional does not necessarily mean a lack of whimsy or humor if that is the nature of the product. It does mean that we need to be consistent through out. If we are selling a very practical product, our display needs to reflect this, by eliminating unnecessary distracting clutter whereas if our product is a special splurge we can be more rich and lush in our displays. We need to consider our work from the eye of a customer. 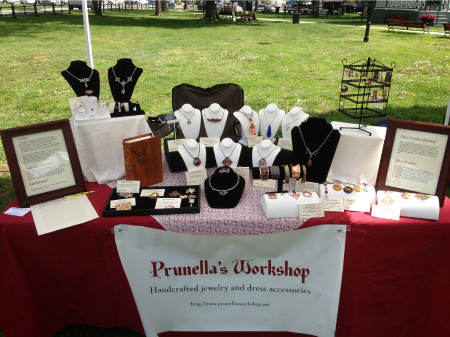 In the case of Prunella’s Workshop, I am creating jewelry with a historical medieval or renaissance influence. Often my audience has an appreciation for fairy tales and fantasy. My display was very clean with very little character. I needed to add a romantic feel and fast. First I focused on breaking up the mass of red of the table covering with a simple sheet of white lace. I kept the original risers, but I also added two small cardboard boxes, which I first covered with white card stock, and then I draped soft white velvet over each. By keeping the two lower risers in the middle of the table and the taller risers on the two ends, the eye swept through everything being shown with no interruptions or choppiness, and it was easier to see individual pieces. A good thing to consider when planning a display for a craft fair is whether it is the display or the work that is catching the eye. For example, Liz of Lush Beads reflected upon using wrought iron candlesticks to hang necklaces. Customers would approach her asking to buy the candlesticks instead of her lovely beadwork. Liz also has more than one line of work, which she keeps separate with different style displays. It can be advantageous to keep very different styles of work separated for ease of shopping. Customers can go directly to the product that is appealing to them and avoid a less desirable style for their taste. By simplifying their shopping experience, they will stay longer looking over what they like instead of getting frustrated and walking away. With the general visual feel of the display complete, I moved on to a more detailed aspect of the display. I started with writing an artist statement that answered a few of the questions asked repeatedly by potential customers, such as where did we come up with our business name, what sort of training did we receive, and how we create our work. I also included information regarding what my products are made of and my custom order policy. I determined that it was very wordy for one sheet of paper, and separated it to two sheets, both framed, and placed on opposite ends of the table. By placing them at the ends, separated by scads of product, the information was available without distracting customers away from what really mattered. Speaking of what really matters, I also wanted to make each individual piece seem more special. Instead of merely having a small price tag attached to the jewelry, I made 3X4 cards including the business logo, the price, a small description, and a name for the piece. I had never named my work prior; however, by including a name for each piece, I emphasized that the work they were seeing was one of a kind art, and special. A necklace once known as “Sterling Silver filigree necklace with black onyx stone” became “Her Hair Was Black as Ebony,” from Snow White, and the prior name became the description. Right away, the piece became more interesting. At times even a good display needs refreshing or updating. This is evidenced by Kerrie of Cody’s Creations. She had a display that adequately displayed her handmade pet accessories so that they were easily seen and attractive to customers who would buy her work. However, she has recently changed her display where she has fun eye-catching doghouses on her end caps. 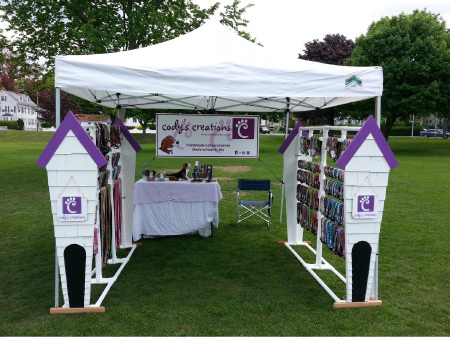 New customers know what Cody’s Creations is going to be about long before they get to her booth and can make a beeline right over if they are in the market for a pet accessory. Customers who do not have pets can continue on without stopping making more room for buying customers. Kerrie also made the smart choice of keeping her color scheme of white and blue, with the same business logo as before. This helped repeat customers recognize her despite the changes she has made. I consider my branding and display strategies to still be a work in progress. There are changes to be made as time goes on and my work evolves. What works in one venue may be a failure in another. However, with just a little thought and perspective, we can make a comfortable shopping experience for our customers and improve our sales. It is also a great idea to do a dry run before a show! This is a great post, Lynn. As I've also started to sell my jewelry at craft shows, I have put a lot of though into my display, but I think I still have a ways to go to make it really stand out and be a part of my business. Oh, me too Bev!! Yikes! We almost blew away yesterday due to high winds. The tent was safe, but my earring display went over a couple of times. Its definitely a work in progress.